I am a programmer. I'd like to improve my workflow by being able to have a "saved workspace". When I start my computer, or whenever I'm ready to resume a project, I want to launch a specific set of browser tabs, terminal windows, text editor, etc. and when finished, "save" the state of my tabs/windows so I can resume again later. My current workflow is to never close any windows and never shut down my computer. I don't know of an application like this but I would really like to find (or build) one. Mac OS X has been trying to achieve something like this on a per-app basis using Saved Application State, however, that will only retrieve the last known state of an app, not some arbitrary one from the past. I'm not sure of any app which can do that. 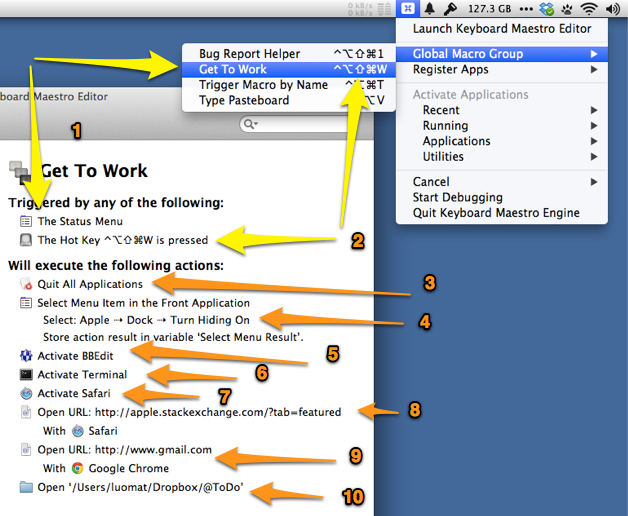 This is very simple to do in Keyboard Maestro, which has a free, 30-day demo on the site. Open the URL https://apple.stackexchange.com/?tab=featured in Safari. this is just an example for illustration. I could have told Keyboard Maestro to run any sort of command, or open specific files in other applications. The only thing which is not possible, as far as I am aware in any app, is the ability to say: "Ok, save everything that is on my screen right now and remember it for later." Not the answer you're looking for? Browse other questions tagged applications automation . Make applications accessible to specific users? Can I download applications/programs that are Mac specific on my Windows PC ? What is the difference between 'Recommended Applications' and 'All Applications'? AppleScript: How to close notification alerts from a specific application? How do I launch an application with a specific JDK?